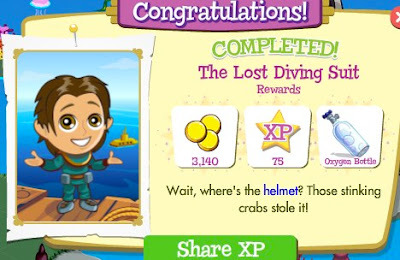 A large new game feature has swept onto the shores of Treasure Isle, as Zynga has unleashed not only a new set of quests surrounding Bermuda, ruins, and eventually the lost city of Atlantis, but they've also released an entirely new Map type, allowing users to don a wetsuit, grab an oxygen tank, and explore the depths of the ocean for treasures! As a big fan of anything related to Atlantis, it's my pleasure to take you on a guide of what to expect from these new features, so meet me behind the break for everything you need to know about your new underwater adventures! First and foremost, you'll need to put together the pieces of a lost diving suit before you can head underwater. In this is where we find a series of four new quests that are available to complete for prizes for a limited time. The first quest is called "Get Oxygen Bottles," and it simply asks you to collect 3 oxygen bottles from your friends. You can do this by posting a news item to your wall from the Quests menu (as seen above), allowing your friends to click on a link to send you a bottle. 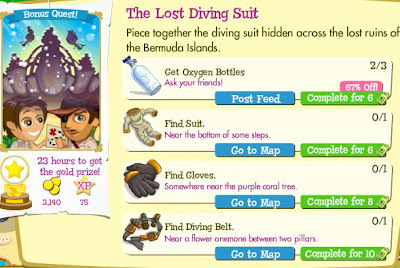 For the other three quests: "Find Suit," "Find Gloves," and "Find Diving Belt," you'll need to explore a new map called "Ruins," in the middle of the Bermuda Islands. You'll need to use the clues provided to find the items necessary to build the suit. For instance, the Diving Belt says that it is located "near a flower anemone between two pillars." Your best bet, then, would be to look for all of the Flower Anemones on the island and start digging in the squares surrounding them. This would be a great time to use any Fire Shovels that you might have been saving, as they will allow you to dig three tiles at once, but only for the cost of a single dig. In this way, you can eliminate whole sections of the island at once, making your search a bit easier. You have a single day (that's just 24 hours) to complete these four steps in order to earn the Gold prize of 3,140 coins and 75 experience points. Once that's out of the way, you'll be alerted that the helmet to your lost Diving Suit has been stolen by a group of Crabs. This unlocks another quest set, with three steps, and another 1 day completion time limit for the Gold Reward (2,800 coins and 60 experience points). These quests ask you to "Get Rid of the Angry Crabs," and "Cover up the Crabs' Holes." Both of these steps take place on yet another map, called "Village." Why the map is called "Village" and not "Atlantis" is a bit beyond us, as you are greeted to the island by a sign saying "Welcome to 'Lil Atlantis," and the island is decorated as such, but I suppose we're willing to look past that design choice. Once on the island, you'll see the Crab Holes and Angry Crabs standing stationary on the map. The Crab Holes take two clicks costing 5 Energy each to cover, while the Angry Crabs can be removed from the map by feeding them a Crab Cake (cannibalism?) which can be purchased for 400 coins, or received from your neighbors as a gift. With the time sensitive nature of these quests, we're guessing it would be easier to just pay the 400 coins - that's what we did. 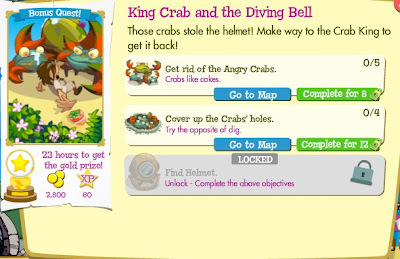 Once the crabs have been removed from the island, you'll unlock the ability to go after the Diving Helmet yourself, which you are told sits "Behind the Crab King" on the "Krab Kingdom" map. 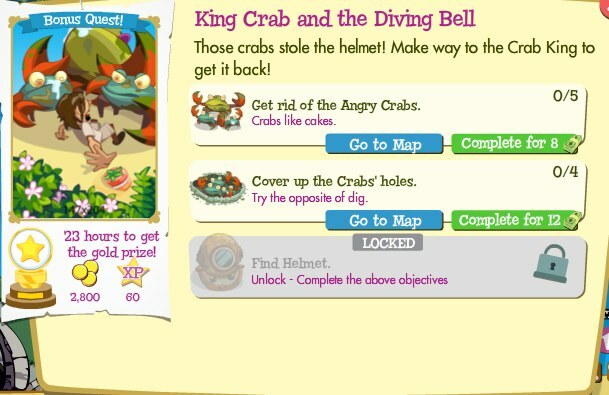 You'll have to remove more Angry Crabs from the map (with Crab Cakes) in order to reach the King, with the King himself requiring 5 Crab Cakes to remove (again, you can either ask for them from friends, or pay 2,000 coins to purchase them in bulk). Simply click on the Helmet to spend 5 Energy collecting it, and voila! Your second series of quests is completed, and you've finally unlocked the ability to go underwater! But that's not all! Yet another quest set (seriously Zynga?) opens up after this one, called "Get Diving Certified." These quests serve as a way to introduce you to the underwater world, but first, you'll need to collect 5 missing pages from the Diving Manual. This is an identical process to that of collecting the Oxygen Bottles above, in that you'll need to post a news item to your wall asking for the five pages. 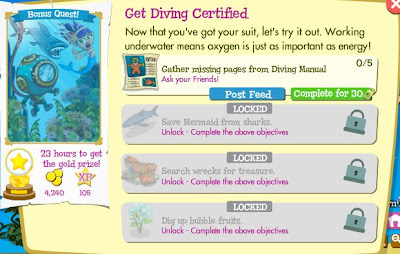 Earning these five pages unlocks the Reef Map, which is an underwater map, along with the three other portions of the Get Diving Certified quest (in the image above). To finish the first step, for instance, you'll need to find the Mermaid in the center of the Reef and give 5 Crab Cakes to each of the two sharks that are surrounding her. Underwater digging works as follows: You need air to breathe in your suit, and everyday, you'll be given 10 minutes (that's 10 real world minutes) of air automatically. You can dig, plant, or ask friends to get more air. That is, friends can send you oxygen bottles as a gift (bottles give out 4 minutes each, as of this writing), you can dig up Bubble Fruits as a bonus (like you would dig up any other fruit or item), and you can now grow Bubble Fruits in your Garden Plots for 465 coins per "seed." They can be harvested in 22 hours. 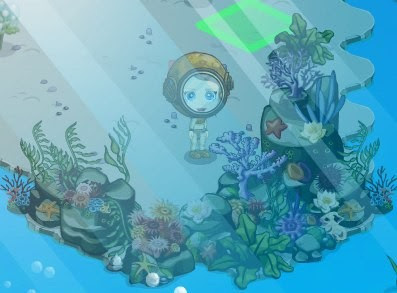 Digging underwater seems worthwhile, due not only to the fact that there are four new treasure collections to complete (Colorful Fish, Sea Life, Sea Plants, and Seahorses), but also due to the fact that Zynga has programmed these underwater maps to offer a better chance at finding gold and experience points while digging there. Functionally, these maps are identical to those above water, in that they have sand, trees (in this case "Coral") that can be cut down, and animals and other path blockers that must be unlocked before digging in those portions of the island. And there you have it! What a lengthy way to open up a new in-game feature, but if you've made it this far, you've definitely earned the right to call the underwater world your second home. Now head out there and finish those new collections! What do you think of the addition of Underwater Maps in Treasure Isle? 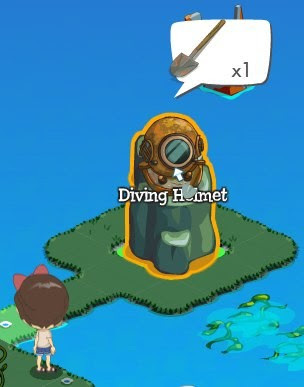 Do you think it's fair that Zynga asks users to complete all of these quests before allowing us to dive? Share your thoughts on this huge new feature in the comments.